There is a long-held misconception that cats need to be able to roam outdoors to be happy, but we think most modern felines would disagree. All the kitty luxuries available today make the great outdoors just seem a little less… great. Whether munching on catnip, traversing indoor climbing systems or watching made-for-cat DVDs, today’s indoor felines seemingly have it made. And as an added bonus, indoor cats have potentially longer life spans because they are less likely to be exposed to cars, predators and some diseases than outdoor cats. Everyone needs a little spot they can call their own. Create a convenient resting area in your home especially for your cat that provides him with privacy. Makes sure it is located where others cannot sneak up on him. Having his own space will help make him feel safe and secure, while also fostering his strong sense of independence. It doesn’t have to be elaborate; a crate makes an excellent resting spot, or you can provide him with an elevated perch so he can feel safe as he looks down on his surroundings. While the thought of having all of your meals prepared and served to you might sound appealing, your feline friend doesn’t necessarily agree. Cats are predatory by nature, so help your kitty fulfill his hunting fantasies by providing him with prey-like toys (think wands with feathers and fast-moving furry toys that mimic mice). Then sit back and watch him stalk and hunt like the tiger he knows he really is! 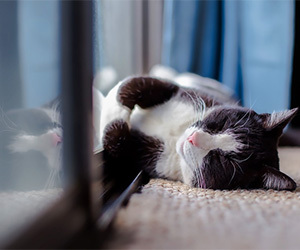 Consider how cats live in the wild when creating your cat’s indoor environment. Outdoor cats can be seen climbing trees, running along fences or sitting in high places so they can keep on eye on their territory. You can mimic these conditions by simply moving furniture around or by investing in window perches, cat trees and climbing systems. Make sure to open the shades on a few windows in your house so your cat can observe the outdoor goings-on. You can even install a bird feeder or two outside for a little added visual stimulation. If window watching isn’t a possibility, try a TV. There are some companies that offer DVDs especially for cats. If you still feel like your kitty needs some outdoor time, there are ways to provide it safely and securely. Try training him to walk on a leash. We know it sounds impossible, but it’s not necessarily as hard as you may think. There are special cat harnesses specifically made for this purpose. And if you’re so inclined, build a custom “catio”, which is an enclosed patio designed to allow cats to safely spend time outside. But before you venture outside, check with your veterinarian to see if your cat needs additional vaccinations or parasite control. Most importantly, be sure to treat your kitty to a lot of one-on-one time with you. Whether it’s playing, petting, grooming or just hanging out, your cat will be happy he’s spending time with you.